I am on record for not being a big fan of waterfall images in general. Unless you place that running water in an wide open interesting context and show the surrounds I find close-ups of running water not so interesting. Wanting to get a nice waterfall image in my portfolio while in Western Australia I figured I might as well get a big one! Or rather, four big ones as Mitchell Falls is not technically one but four stringed together. Mitchell Falls are found on the Mitchell Plateau, off the Gibb River Road in far north Kimberley, Western Australia. Access requires either a plane or a fun but spine-breaking 5-6 hours of driving on a corrugated rocky dirt road turning north from the Gibb River Road up the Kalumburu Road. The Gibb is a highway compared to the Kalumburu, especially the last 90 k’s to the Mitchell Falls camp ground. I went with my mate’s company All Terrain 4WD Safari and we broke both back shock absorbers going up there! Hardly felt it though, was so bumpy anyway! Just a few days earlier, two 4WDs had rolled over on the road, so if you go up here, safety first and get all the up to minute advice on the road condition from Drysdale River Station. Once at Mitchell Falls campground you trek about 4-5 gorgeous kilometres through the outback crossing rivers and other waterfalls to get to the Mighty Mitchell Falls. Safely arrived you trek around the waterfall and this is where the real fun begins – find a good spot for shooting without actually testing gravity too much! The area is bushy and rocky and first of all with a steep drop into a huge plunge pool. Very much like the wall you see on the left side of the image below. I did not want any foreground protruding into my image rather I wanted a clean composition. I accomplished this somewhat hanging over the edge, holding on to camera, tripod and cable release with one hand, holding on to a tree with the other hand. With the waterfall roaring loudly in front of me almost shaking the ground this was quite a thrilling shoot. I used my 9 stop ND filter to slow down time or rather prolong the exposure (how awesome if this thing could really slow down time!). Unable to look through the viewfinder – that would test gravity too much – live view was extremely handy for composing this 2 image vertically stitched panorama. I like this composition as there’s a great sense of height here. I am also releasing this image as a horizontal panorama as well as seen below. Must cover all bases now that I finally captured a waterfall! Frank Herbert’s Dune is quite possibly my favourite book. Ever. A masterpiece of writing. A masterpiece in science fiction. A masterpiece in any genre. So brilliant even people who are not into science fiction absolutely love it. If you have not already read it, I suggest go out and buy it now! If you have read it, it’s probably time to re-read it! I am re-reading it presently for the umpteenth time. 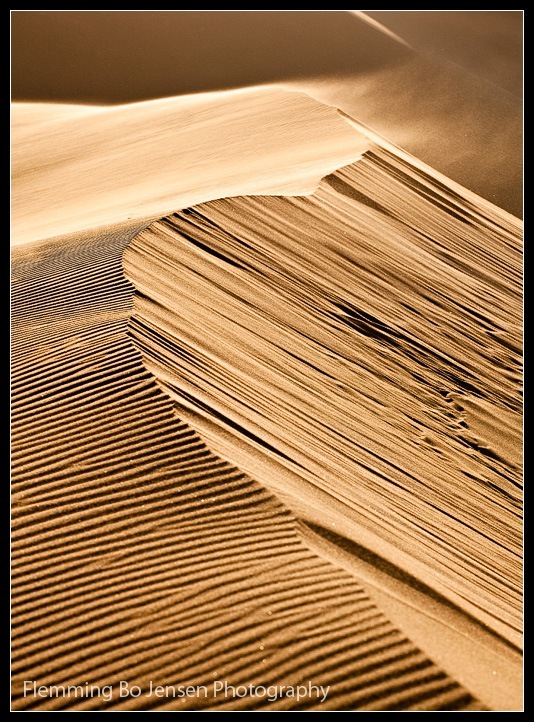 A recently developed shot from Namibia was pointed out to me by a friend of mine as having some nice Dune (the book) qualities. Most dune images from Namibia could easily be mistaken for the sand planet Arrakis (a planet with just sand – my paradise!) This one has special Arrakis qualities though.The Light and the Darkness could easily conceal some Fremen fighters or a Maker worm. Study the light, the darkness, the shapes and the lines here and tell me what you think. And remember: Think you of the fact that a deaf person cannot hear. Then, what deafness may we not all possess? What senses do we lack that we cannot see and cannot hear another world all around us? No Fear. Fear is the Mind Killer! Selamat Pagi apa kabar? During my assignment on Borneo I shot a few images in and around the town of Pankalang Bun where we stayed. Images that I have very kindly been allowed to also use myself. So I am very happy to be able to present to you this fascinating glimpse of life in Pankalang Bun and my visit to the Orang Utans in the the Tanjung Puting National Park. The Borneo gallery can be viewed here and don’t forget the couple of videos I have online at vimeo. I have a tendency to overuse words like mind-blowing and amazing, something I discovered when running out of words to describe Borneo. It is a completely different life and deeply fascinating. A River Runs Through It and is everything to everyone. Food, shower, laundry, swimming pool. A hot humid tropical heat and the smell of teak tree bombard your senses. The people are some of the most friendly, smiling and polite I have ever met. Mobile phones and scooters are everywhere. Fuel for your car or scooter is sold in a Coke Bottle. All the colours in the world seem to have gathered in Pankalang Bun as every house, boat, sign and all clothing are vibrant and saturated off the scale. And had we landed in a spaceship, had 8 arms and green skin, we would not have created any more attention than we already did. It is mind-blowing…and I really like blowing my mind. Have a look at a few samples here and then head to the gallery for more, although my travel photography does this experience no justice at all. A most fascinating visit to see the Orang Utans was arranged for us by our fantastic hosts. About 415,000 hectares have finally been set aside as a National Park, presently home to about 5,000 orang utans. Many of them rescued from other areas of the island and relocated here to survive. The things we do to our planet and fellow inhabitants. To think we came close to wiping out these incredible animals. To meet these gracious creatures in their environment and study their behaviour is so fascinating you never want to leave. I guess we see ourselves in them, they are so human-like it is spellbinding. 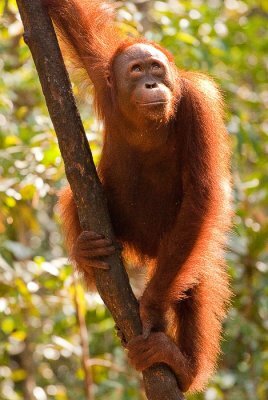 Borneo – I look very much forward to another mind-blowing visit! And I must find the time to tell some more stories like: sailing on the river in what can only by described as 3 wooden boards and a two-stroke engine, drinking Pocari Sweat, the airport where boarding passes are hand written, best food in the world, learning Indonesian language and how not to be eaten by the cannibals! As a follow up to my post about Patterns in the Desert, I present images once again from the beautiful sand dunes outside of the towns Swakopmund and Walvis Bay in Namibia. Patterns, shapes and lines are all very essential tools for composition and when Mother Nature presents you with the Namibian smorgasbord you are in heaven as a landscape photographer! Later that same afternoon, the clouds felt left out so they demanded attention by creating these beautiful cloudscapes at dusk. Both of these shots were shot using a 3 stop ND grad filter, an essential tool here as the sun sets on the other side of the dunes and the ND grad filter is necessary to even exposure and get detail in the foreground. Incidentally, I find it incredible the way a smell, a taste or a sound can be linked so strongly to the memory of capturing a photo. As I study these photos I taste “Jungle Energy Muesli Bars” in my mouth. I very distinctly remember wolfing down these energy bars at night when I loaded these raw files into my laptop and was rather pleased with the result – and the muesli bars! Finally; these gorgeous dunes are small in comparison to the massive 400 meter tall Naukluft dunes but are still about 50 to 100 meters tall and spread out over 30 kilometres of coast between Swakopmund and Walvis Bay. Witness from above, these gorgeous dunes, neighbour to the sea. Amusing anecdote from this day. As I am shooting these images my friends Gudrun and Svenn are waiting in the car a few hundreds meters away. It is a rather windy and chilly day. I feel an urgent need to use the bush toilet (should it be called desert toilet here?) to relieve myself of the nice coffee from a café in Walvis Bay. I water the sand and hear intense whistling and woohoo’ing from my friends. As they are at least a few hundred meters away and it is dark I can’t really see what they are doing. So I gather they are cold and tired and want to go. I hurry (with the shooting not the peeing) and get the last few shots, it is almost pitch black anyway and I rush back to them. At which point I of course learn they were laughing and whistling at the sight of me, the camera, the tripod and the desert toilet situation. I can be rather slow at times! I recently upgraded my Vimeo.com membership to Plus status, and uploaded a few of my Canon 5D Mk II videos – more to come. Before my 12 days assignment in June in Malaysia and Borneo, shooting video did not really enter into my thoughts when I was working. However, working with Michael from TV Asia and Georg from Livingfilms.com opened my eyes to how much fun video shooting is. The video quality of the Canon 5D Mk II is outstanding so we ended up using my camera quite a bit, mounted on a great Sachtler video tripod with me as the camera operator (I have all the raw footage and on more than one occasion I can be heard saying ‘action!’. Oh dear! Spielberg syndrome). It was a great and fun learning experience. When I get the time I plan to edit some small movies from my travels. For now, enjoy the raw footage on my Vimeo profile. Here are a few movies embedded, but I recommend clicking text links (click the title in the video to view them at large size on Vimeo instead of these embedded videos. With a fast connection, you should click on ‘HD’ in the video player on Vimeo to enjoy the movies in HD. And while you are on Vimeo, check out the incredible videos from Mike Fletcher! I wrote earlier about zooming in and picking out patterns in the desert from the air. It works equally well when you are on the ground, feet in the sand, head in the clouds. 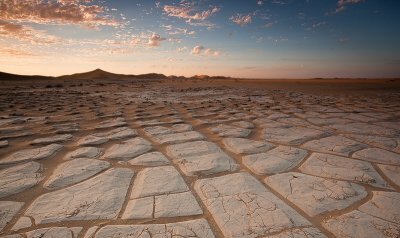 Often in Namibia the elements present are only sand and sky, a landscape so pure and simplified that you almost cannot believe this is the work of the usual rather chaotic artist Mother Nature. Quite often as a landscape photographer we work hard to simplify and pick out a ‘less is more’ simple composition in a somewhat chaotic setting, as Mother Nature likes to throw in a bit of everything in her work. Here you have to think in reverse! Fortunately sand is a magical element especially when Wind joins in and paints perfect patterns with a fine brush. The dunes just outside of Swakopmund and Walvis Bay on the west coast of Namibia are only half as tall as the mighty Naukluft National Park dunes and are yellow, not orange. They are however on the coast so Wind the Artist has the perfect playground for creating patterns in the sand. Every day magic happens when the sun is low enough to provide side lighting. Harsh and flat at midday, at sunrise and sunset the shadows come out to play. And so do I. Here are two different examples of sand, shadows and wind. This is a classic Swakopmund dune beaten into shape by a strong prevailing Wind from the sea creating ripples, shapes and patterns. I am shooting at 17mm using a view camera style composition, focusing at roughly the hyperfocal point to get as much depth of field as possible. This is where a tilt-shift lens would be most handy for creating unlimited depth of field. This day the Wind was flexing muscles and blowing a gale across the sand dunes creating some brilliant effects of sand blowing in the sun light. I am using my 70-200mm lens at around 130mm to zoom in and pick out patterns and compress the image. The shadow behind this dune is from a larger dune creating nice contrast for the sand in the air. 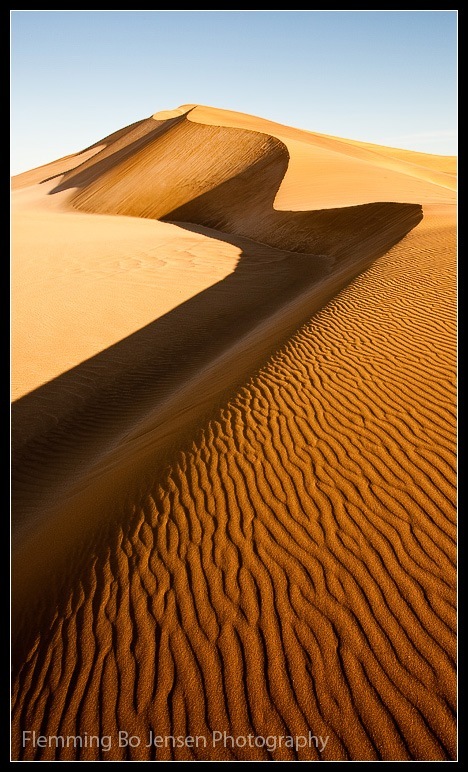 I love this image but looking at it I should have scaled this large dune, gotten close and switched to wide angle lens. Why? Depth of Field. As you see the foreground is blurred, f/11 at 130mm does not create a large enough depth of field to hold everything in focus. The shallow DOF creates a different look of course, but I do wish I had a larger DOF version. I opened up to f/11 as I needed a fairly fast shutter speed to capture the blowing sand particles and keep the image sharp as the wind was fiercely moving my tripod, camera and me (what we do for art! It is a dangerous gig this landscape business). I am quite pleased with how my updated profile turned out and wanted to share the text with you as a post on the blog, so here goes. Thanks to Casey for the profile photo, Signe for helping with the writing. Imagine sitting in a large rock cave having climbed 30 meters up a cliff. You look out over the wide open floodplains offering a timeless panoramic view. No roads, no power lines, no people. You look down and feel the grind holes in the rock from thousands of years of grinding paint and food. You turn around and study the rock walls, graced by aboriginal art 40 to 60 thousand years old. You breathe. You take it all in.